Last week saw the opening performance of Sue MacLaine’s vessel at Battersea Arts Centre. 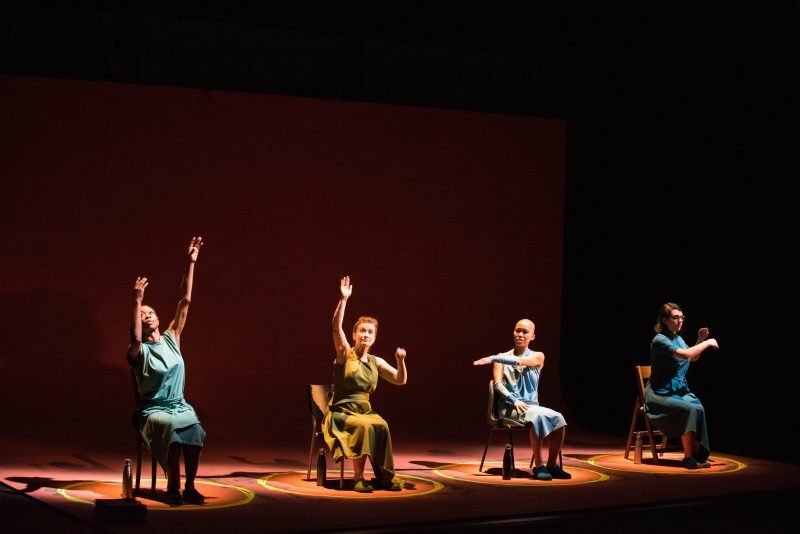 Taking the premise of medieval anchoritism, the show pushes the relationship between aurality and visuality to its absolute limits, presenting four female voices speaking on a range of topics while the script is projected onto a large background screen behind. Instead of traditional dialogue, the show uses a technique of simultaneous recital. Words and sentences clash and collide to create a crowded and austere spectacle — the four parts are predominantly similar, with delays and pauses ensuring that we hear each phrase several times in quick succession. 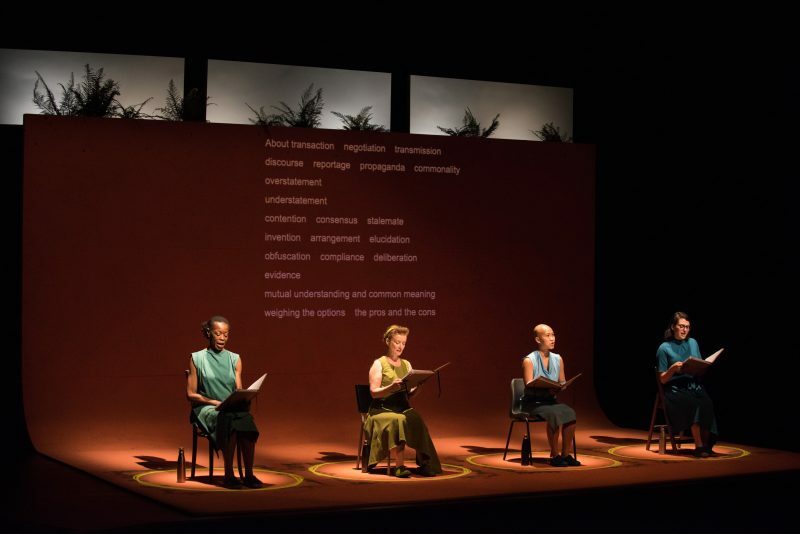 ‘Let’s talk’ is the stem of many of the sentences in the play’s first half, giving the impression of forthcoming discussion. In reality though, what follows is a barrage of language which circulates furiously in the space without seeming to independently affect the four performers themselves. With such a cacophony, MacLaine’s script forces itself upon us not only as communication, but also as noise — on the second or third impression, we hear each word as a sonic unit increasingly detached from its meaning. 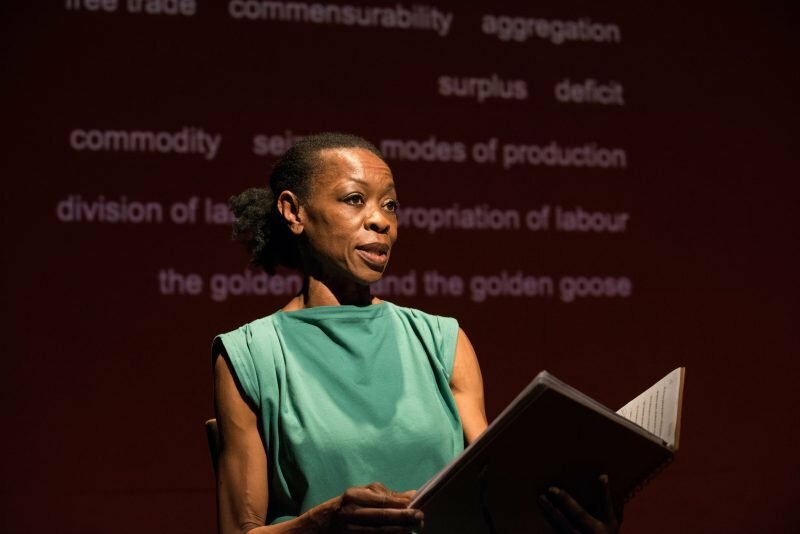 The opening line: ‘Let’s talk about who has the privilege of speaking first, and who is privileged to speak first’ immediately sets the thematic tone — the piece goes on to reference a variety of societal structures, encompassing economics, the nature of Capitalism, patriarchy, and misogyny — as well as its origins in the Book of Genesis. Again though, to say that these topics are ‘discussed’ is to overstate and simplify MacLaine’s project. She is concerned with how language interacts with itself, not how characters interact with each other. All the discussed themes of course have wider relevance, but the ecclesiastical setting somewhat stifles this with the continued suggestion of female isolation. Then again, this contrast is a key source of the play’s intriguing power. Because of the intensity of the piece, we revel in its moments of vocal singularity and feel cushioned by silence when it does come. When a piano-score accompanies the actors’ ritualistic movements at the play’s close, we can appreciate the spectacle while still feeling the script’s residual meaning. MacLaine’s writing though is at times intellectually intimidating and slightly stifling: lines like ‘Let’s talk about the privileged signifier’ do demand a theoretical understanding from the audience, and although this complexity is offset by discussion of pubs, balloons, and household plumbing, there is a sense that further explanation or omission of some of the play’s more philosophical discourses would increase its accessibility. Ultimately, the piece is an investigation into how language carries association, with an incisive critique into patriarchy providing its thematic strength. The anchorite premise is a clever frame, setting a sincere but inquisitive tone with lines like ‘I dig my own grave to better contemplate my own existence’, but for some of the topics referenced, further editing would give them a clearer presence as they do battle for our acoustic attention.